On Sunday, December 2, 2018, Lucas Torreira scored his first goal for Arsenal. The tiny Uruguayan player approached, disturbing Eric Dier, forcing the Tottenham midfielder to repel him, losing his concentration, and managing to get trapped. When Aubameyang's decisive ball split the Spurs defense, he made Dier lose. Dier tries to stop the ball by attacking, but against the wind. Torreira then touched the ball and managed to throw it into the goal. Hugo Lloris: Arsenal 4, Tottenham Hotspur 2. After the goal, Emirates Stadium, the headquarters of Arsenal, exploded like a firework on New Year's Eve. There are colorful smiles in the fans of Arsenal, the result of an already relieved heart. The heart rate was back to normal. On the other hand, the silence enveloped the bleachers filled with Spurs fans. The stand really looked like a sleepy city. The Spurs fans were becoming languid as Torreira undressed and ran to the corner to celebrate his first goal. However, this is not the goal that prompted the BBC and Gary Neville to finally crown Torreira in the match for the North London derby. The goal is just a bonus. The BBC and Neville agreed that the appearance of Torreira that day had resulted in a significant lack of Arsenal's defense after Gilberto Silva's departure: the ability to fight. "Torriera sets the pace, leaving no room for his colleagues, they see him as a busy dog, the other players have to react and develop," Neville wrote on Sky Sports. According to Martin Aguirre, a Uruguayan writer, victory in playing football is like a religion for Uruguayans. When Luis Suarez was cursed by many people at the 2010 World Cup because he had openly touched the ball to prevent Uruguay's keeper from conceding, he was considered a hero by the Uruguayans. Similarly, when he bit Giorgio Chiellini's hand at the 2014 World Cup. World public football might consider Suarez's behavior disgusting, but the Uruguayans knew that Suarez only wanted his country's victory. Aguirre then described the desire to earn more Uruguayans. "Watch amateur football matches in every corner of Montevideo and watch some of the fiercest football games you've ever seen - the game between people working in an office, classmates, and friends. from childhood will go intensely and all want a victory. " Druda said that "Torreira's defense ability was an unexpected gift." From there, Massimo Oddo, coach of Pescara U-19, then changed the position of Torreira. The Frey Brancos player was played as a defensive midfielder. At first, Torreira struggled to adapt, but he still struggled to master his new position. Oddo was surprised by Torreira's efforts. 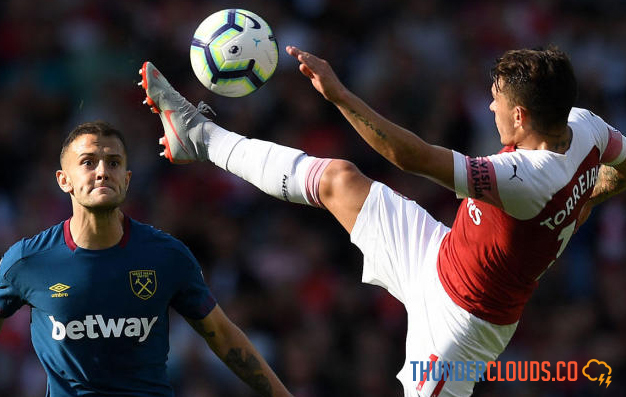 Challenging Torreira's fighting power, through luminous allegories, once Oddo had even once said to Druda, "If you explain the tactic once in Torreira, he will practice it forever." Three years later, Torreira became part of the young Sampodria team. Playing for two seasons in the Genoa-based club, Torreira began to be recognized for two qualities that usually could not be: a fierce and intelligent fighter. 0 Response to "Lucas Torreira, The Balance Guard at Arsenal"